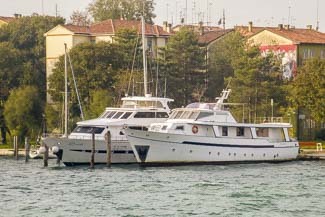 The Sarah Sun Island is a "Boat & Breakfast" aboard two small motoryachts on the small island of Sacco Fisola, across the Giudecca Canal from the San Basilio cruise terminal. You're most likely to enjoy the Sarah Sun Island experience if you're a boating fan. The Alilaguna Linea Blu airport boat is slow (about 1 hour 45 minutes), but getting from the boat landing to the Sarah is both easy and quick. Turn right as you exit the boat on the floating platform in front of the Hilton Molino Stucky Venice. Turn right when you reach a bridge, the Ponte Lavraneri. Cross the bridge to the island of Sacco Fisola. Walk to to the Calle Fisola, turn right, and continue walking. In a moment, you'll reach a cross street named Calle della Sacca. Turn right again and walk to the canal. Turn left at the canal. The Sarah and its sister yacht will be moored ahead of you, before you reach the Giudecca Canal. Buy an ACTV vaporetto ticket (or, better yet, a 12-hour to 7-day Tourist Travel Card) at the Hellovenezia ticket office or a ticket machine by the boat piers. Take the No. 2 water bus in the direction of Giudecca and San Zaccaria. Get off at Sacco Fisola. Turn left and walk along the waterfront to the Canale dei Lavraneri, where the street turns right. Continue around the corner, where you'll see the Sarah and its sister yacht moored along the side canal.